California counts on the nonprofit community. And the nonprofit community counts on CalNonprofits! Join us! 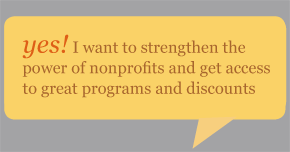 CalNonprofits membership has something for everyone in your nonprofit. "We are always amazed at how much work and services are provided by CalNonprofits, despite having such a small staff. Our membership more than pays for itself, every year." Details on all of these discounts and special programs are here, or you can watch the recording of our member benefits webinar here. Join us now to get all the benefits of CalNonprofits membership! Sign up online or download our registration form and mail it with your check. Questions? Contact our Membership Manager. CalNonprofits has great customer service and they are always professional and helpful. Best of all, they advocate for us and get us the best insurance rates. I highly recommend joining the California Association of Nonprofits.